How does Purpose drive profit? What leadership methods improve results? Why is it vital to preserve balance between your responsibilities and Principles? These questions are discussed during No-Excuses Growth Executive Roundtable sessions. Other topics include: increasing sales, improving sales team productivity, keeping pricing competitive, evaluating website SEO, accelerating production throughput, encouraging initiative and teamwork, managing performance, investing in technology, fostering employee engagement. 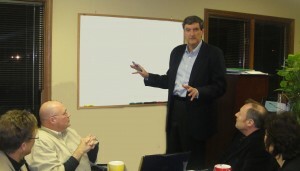 Our executives choose the topics we examine each month. Leaders are consumed with guiding their businesses to survive and react to the marketplace. But leaders are also the only ones responsible for delivering future growth. Carve out time in your schedule to focus on future as well as current. Invest a few hours each month learning and sharing to grow your business. The Roundtables are working sessions – not presentations – and they will energize you. CONTACT US at admin@grolistic.com or call Bob Schultek at 216-272-4449 to schedule a complimentary consultation or to learn more about our executive roundtables.